Mathematical is very interesting subject. Math Logic puzzles are the brain teasers in which you have to use both Mathematical knowledge as well as Logical Reasoning. Here is one such Math Logic Puzzle in which your challenge is to decode the given Math Logic Equation. Can you decipher these equations and find value of missing number? Can you crack this Math Logic Puzzle? 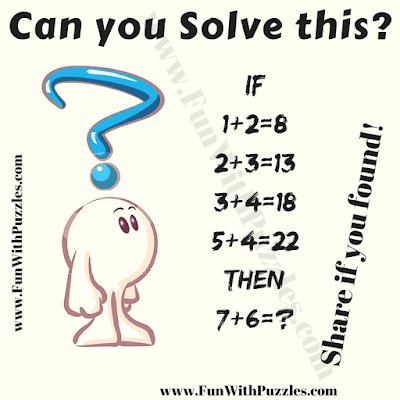 Answer of this "Math Logic" puzzle, can be viewed by clicking on button. Please do give your best try before looking at the answer. If A+B=C is the given equation, then Logical pattern for this equation is (A+B)*3-A=C.